Happy Monday everyone... 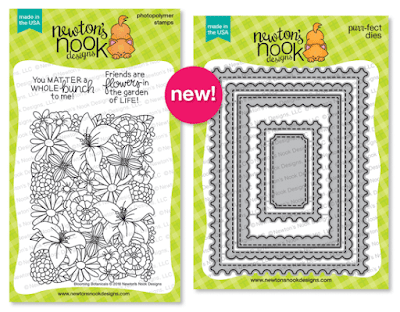 It's time for the May Release from Newton's Nook Designs. You are going to love this month's release. 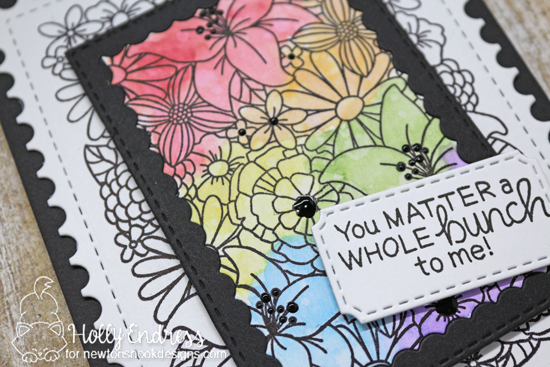 Today we are introducing the Blooming Botanicals Stamp set and Framework Die. The Framework die works great alone or you can pair it up with our Frames and Flags Die set as well. I started my card by Stamping the Blooming Botanicals stamp onto two pieces of Watercolor paper with some Archival black ink. Then I used the largest die in the Framework set and die cut the first panel. I adhered that to a Black A2 size card base. Then using the third die in on the set the small scallop frame. I die cut the second piece of watercolor paper and again from a piece of Black to create a frame. I used the Spotlighting technique here but adding some Distress Inks to just the smaller portion of the image that I die cut. I watercolored the image and then I added the framed piece over the larger portion lining it up. I adhered it with some foam tape for some height. Then I added some Black gloss Nuvo drops to parts of the flowers and set it aside to dry. Once it was dry I die cut the smaller frame and stamped the sentiment in Black and adhered it off-centered along the edge. Would you like to win the “Blooming Botanicals” Stamp Set? Comment on the NND blog and Design Team blogs (see list below)! The winner will be chosen at random from the collective reveal posts. Make sure to check out each of their blogs and comment for your chance to win. You will not know which blog has been chosen so the more you comment on the better your chances are of winning! You have until Thursday, May 17th at 9pm EST to comment -- winners will be announced on the blog post on Friday, May 28th. Your card is beautiful! I love the spotlight technique! Very pretty and I like that you used the spotlight technique with these frames. Beautiful card! I love the way you colored the framed area of the design! The Blooming Botanicals stamp is so pretty! What a lovely card! The rainbow colors simply shine against the black and white. This is gorgeous - love the black and white with the color highlights! I love the idea of the rainbow in the center! What a fun way to add some color popping out of the image! So cool! Great layering showcasing the new die set! Just love what you did with the new goodies! Unique card!Thanks for the chance to win! I love all the black and white with a focused pop of color. Beautiful new set! I love how you did the watercolor and added the frame. Beautiful! WOW! Just stunning! I love black/white with a pop of color. Love your coloring, pattern, and design. And the new die cuts are amazing too. Just a wonderful release. Thanks for the inspiration! The blooming botanicals are stunning! I love how you've colored them as well. Of course a new frame die set is always a must. So many ways to combine the different sizes. These frames are all so much fun! Love the new designs! The Blooming Botanicals Card is absolutely gorgeous! Love the pop of color. So inspirational! Love your colourful panel onto black and white. It just pops! 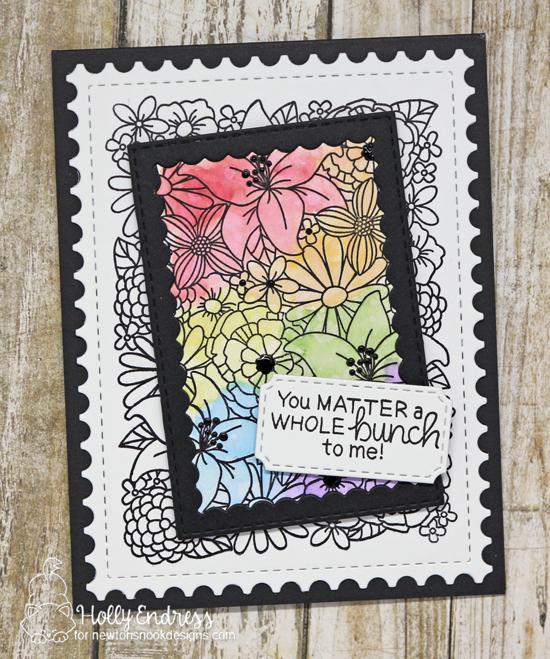 love how you incorporated black and white and rainbow in the same card! What a great idea!!! I wonder what the cat or dog one like this would look like! ooohhh...LOVE the black frame idea! Makes the sentiment pop!